So I've worn glasses since before I was three years old. I'll be 24 in July. That is a long time. I was (am, AM!) so incredibly clumsy when I was younger. My dad tells me stories of me running into walls, and tables and bookshelves, and OK - basically everything. My parents couldn't take me anywhere, I'd trip over my own feet and anything uneven on the ground. I had no eye-hand coordination, so what did my dad do? Enrol me on the soccer team, the softball team and the basketball team. It was embarassing, but you know I never really cared. Sure, I got loads of comments about the glasses (what little kids with glasses wasn't called Four-Eyes) and I remember the time this little kid stomped up to me and asked if I was 'long-sighted, near-sighted or just cross-eyed?' And it got annoying when the teachers scolded me for not paying attention (WHEN I WAS LOOKING RIGHT AT THEM) But oh well. When I first started with the glasses, they were massive and magnified my whole face (see the picture - on the back of the photo I have, my grandmother's written 'I can't believe I'm related to this bunch' or something similar. 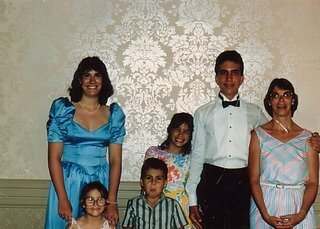 That's my cousins Julie, Angela and Joseph with my Aunt JoAnne plus me and my brother David in the front) but do you want to know a secret? I don't need glasses anymore. Seriously, my optometrist has said I only need them for extended periods of TV, using the computer or for reading. I don't need them for a physical reason, I JUST HIDE BEHIND THEM. I got my first glasses aged about 6 and because I had a so-called 'lazy eye' they put a plaster over the other lens. So there I was with my sad little pink NHS glasses with a patch. Tragic. Oh and I totally hide behind mine too. I don't feel like myself without my glasses. Too exposed. Becca - oh my god, I hate contacts. I tried wearing them for a few years, and I just couldn't do it in the end. I was useless at getting them in and out, and had red eyes the entire day, but I didn't want to wear glasses in my wedding photos, so I went with it for awhile. People have told me I squint in a very unattractive way without glasses. Keris - Ha! I have a lazy-eye apparently as well. Except not anymore, I guess. They made me wear a patch like a pirate. No one at school thought it was cool though. And I had bad frames year after year - pink plastic, purple plastic, even bright red which clashed with everything. I have to be thankful though, when my eyes got better, my mom's got worse - I think she's now legally blind with 20/1000 eyesight at 43. Yikes! I first got glasses when I was 6. I was near-sighted and couldn't see the blackboard from where I was sitting so I had to wear them, anytime I was reading, basically. But I was really bad at taking care of them. I can't recall how many I broke, but I do remember hiding them under the t.v. stand so my parents wouldn't find out. I tried contacts once but my eyelids wouldn't cooperate. I never did like the idea of sticking a foreign object in my eyes. I can't even stand getting water in them! Anyway, you look absolutely adorable in this picture.